Also make sure you check out this video clip where I demonstrate how I use the black foamie thing to flag the light from my on-camera flash. In essence, the (in)famous Black Foamie Thing is just a simple little device that I use to shield my speedlight’s output from directly hitting my subject when I bounce my flash forward. It has another benefit in that since I usually fasten to the ‘underside’ of the flash-head, it blocks light from hitting people in the face that are standing behind me or next to me. It really does help with being more unobtrusive with flash. Soft, directional light from my flash – this is the main reason why I use this piece of black foam on my speedlight when I use flash indoors. The moment I start bouncing my flash ‘towards’ my subject, instead of over my shoulder, away from my subject … then I stand the chance of there being too much direct flash on my subject. This usually results in hard shadows and specular reflections on skin. The light from direct on-camera flash rarely looks good. What I am trying to achieve in bouncing my flash when shooting indoors, is directional light that is also soft. This example of a model that I photographed during a workshop, shows the kind of light I get from my on-camera flash – it is directional because I’m not bouncing the flash directly behind me, and I’m also not bouncing the flash off the ceiling above me. Bouncing flash off to the side, and even slightly ‘towards’ your subject can give you strikingly dramatic light from just an on-camera speedlight. Here’s an example from a recent workshop. To my eye this looks surprisingly good for merely one on-camera speedlight (and allowing some of the ambient light to come into play.) What we’re mimicking here is ‘short lighting’ as it is usually achieved in a studio. Also read this follow-up article on why I chose a piece of black foam over something that is white. This becomes important too. In bouncing flash behind you, or off to the side, you are wasting a huge amount of light from your flash. It really isn’t the most efficient use of your speedlight’s output .. but it does look pretty. With this, you are dumping a lot of light .. and this can be hugely annoying to guests and other people standing close to you. Looking at how this BFT is mounted on the flash, you can see that the light from the flash is now directed upwards, and very little will be able to sear the retinas of people next to you. Now, what I also wanted to show with this post, is that I manipulate this piece of black foam. The original post on my favorite flash modifier, showed a neat piece of black foam .. and also longer than I usually have it when I actually shoot. In practice, I fold it, and shape it the way I want it to be .. juuuust enough to block the light in the way I want it to be. 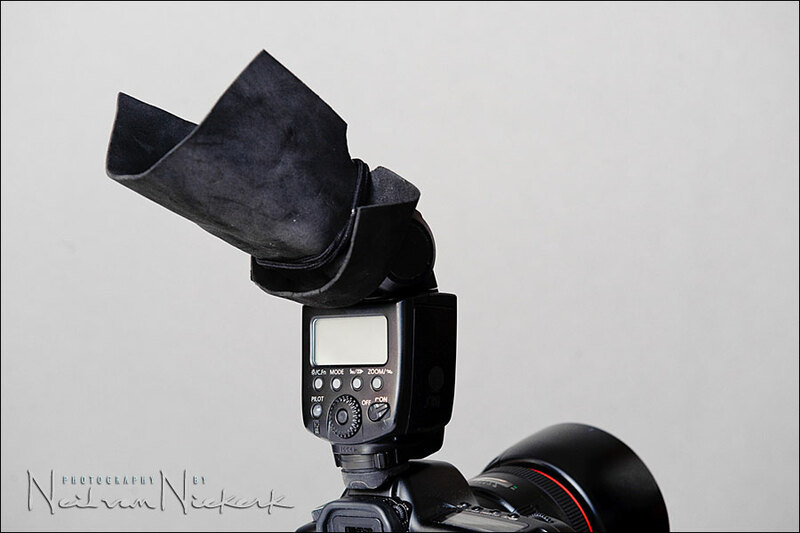 The piece of foam can be slid around the flash-head, and it can also be slid up and down the flash-head. I position this half-snoot / flag in whatever way I need to at any particular point .. depending on what I want to do with the light from my flash. And finally, another benefit ..
– it is inexpensive and simple. 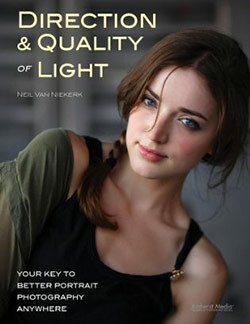 This little device is all about the best quality of light you can get from your on-camera speedlight. There is no expensive ver.2 that needs to be bought again next year. It is a cheap piece of black foam held into place by two hairbands. That’s it … oh, and the thought you need to put into HOW you use your flash. In the end all this is NOT about a specifically shaped device with an a fantastically designed strap; and manufactured to tight specifications and engineered perfectly … this revolves entirely around HOW you use the light from your speed light. This on-camera flash modifier divorces the gear-head approach; (“this device on top of my flash will solve all my flash problems!”) .. from an artistic approach; (“what do I want to achieve with my light?”) At the very center of all this, this is about technique in lighting. throw away the tupperware on your flash! I’ve been using this “black flag” idea since reading your original post about it…quite a while back I’ve more recently made one with a velcro band attached to hold it on. Thanks for continuing to share your techniques! Love using this now, took a little to get used to it but it is finally coming together for me. Always love reading about this as well. Paul, here is a diagram of approximately how I bounced the flash. As mentioned before, it is an inefficient way to use the speedlight, but the light that returns is sweet indeed .. and directional. 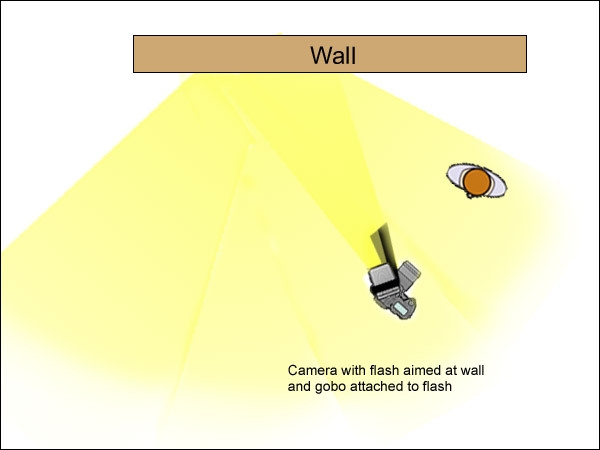 As you can see from the diagram, I use the piece of foam to flag the light so that no light from the camera’s point of view falls directly on the model. Since reading your articles on the black foam half-snoot, I’ve been using a cine-foil version as I had no black foam to hand. It works great but allows more control in shaping and folds even smaller than a sheet of foam. I am a great fan of you and your techniques. just a query, what flash mode to use when using this black foam or any other flash modifier. Kamal .. typically I’d be in TTL mode on my flash, since when I use on-camera flash, I am most likely moving and not in a constant position relative to my subject. The moment that my subject is in a static position relative to my lights, then I would use manual flash .. and different methods of creating softer light. 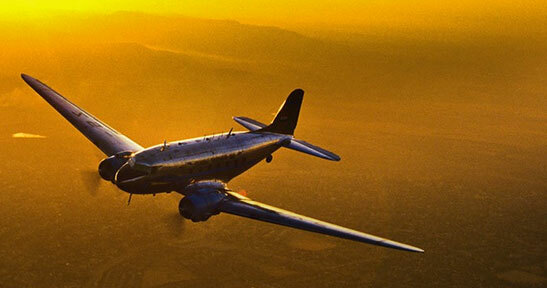 Great site, great images and great book. And thanks, someone finally said it . . . I must admit I rarely use flash photography but when I do I use techniques that I have learned from you. If this is the case why not make a black foamie thing with a white colored or reflective surface on the side that faces the flash in order to bounce just a little bit more light? Warren .. check out the original post, and scroll down to comment #37 with the image of the bride preparing. The explanation is there why I chose something black to flag and direct my flash. In the interest of saving some time with trial and error, what dimension of your ‘foamie thing’ seems to work the best overall? Bill, it’s about 6×7 inches .. but as you can see from the images here, I fold it and shape it and pull it back as I need. So the actual dimension is usually quite smaller. 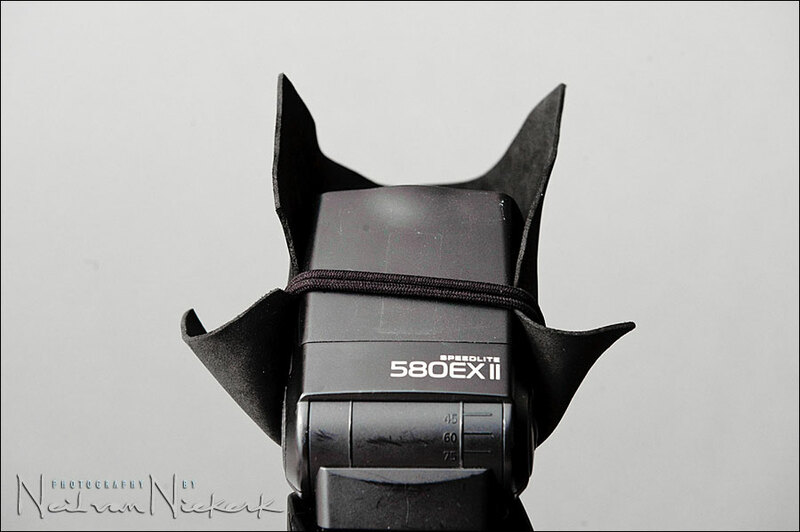 To those who use velcro: I too had velcro on mine until I went to the workshop and what I learned is that the velcro is a real limiter, and the hairbands are a key part of the system as well. These allow, as Neil points out in the original post, one to slide the 1/2-snoot around arbitrarily and easily depending on which way you are pointing. No more velcro and things are working that much better…(except my daughter is minus a couple of hairbands — for which I blame the cat). And give us a tutorial post on a few techniques and examples. By they way, I started scrolling down the post you suggested we should look at for an explanation as to why you use a BLACK foamie https://neilvn.com/tangents/my-choice-of-flash-modifiers/, and therein looked for Comment #37 but I note that when I began scrolling the comments are not numbered. So how do we find Comment #37 (short of counting each and every comment)? 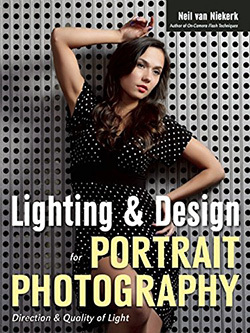 You want more tips and tutorials on flash photography and lighting techniques? Then I suggest you check this link out! As for the numbering of the posts .. it’s a hiccup with Internet Explorer. Only some numbers show up in IE, such as track-back links. The numbering works properly in Firefox and Safari though. But .. that’s why I specifically mentioned to look at the post with the image of the bride preparing. Thanks for sharing your knowledge and skill. Yep….the “black foamie thing” is a great tool. I use it and love how simple and effective it is. I bought some cheap stretchable velcro and made a strap rather then the hair bands you use. Works like a charm. Thanks for this update on a wonderful invention. Since I read your book, I’ve been using this black foam + hair band contraption. And this thing almost never leaves my flash. Recently though, I’ve learned that if I use smaller apertures like f5.6, my 430EXII is sometimes not powerful enough (even at higher ISOs) when I bounce my flash with the foam. So sometimes, I do have to remove the foam and just bounce the flash over my shoulder. Or when the flash is slightly pointed towards the subject, I try to block it with my hand. My foam is longer and looks like how you did it in your book. The only problem I have is that I find it inconvenient to take the foam on and off my flash. Is there an easy way to do this? Do you just slide it down or fold it out? Or do you completely remove it when you don’t need it? Chris, I just roll the foam around or whip it off. With the one end (at the hairbands’ side) is rolled up, then the whole thing slides around more easily. There’s no specific thing that I do. I just manipulate it as I need it. is yor 5802 flash set to any particular setting when shooting with the black foamy thing? Example what was your zoom setting and your compensation setting at the time of the shot? or was everything shot with the TLL setting. David, I usually zoom out to the maximum setting. Flash exposure compensation is something that I dial up and down as I need to. I do this by pre-judging the tonality of my subject and scene .. and then by looking at the LCD preview on my camera and adjusting it for the next image. I am a big fan of your website, techniques and now have even purchased a copy of your book. I must say that you have helped me understand a lot about lighting in general. The black foamy thing was kinda what started it all for me. I do not have the inclination to carry around a bunch of flashes, battery packs and modifiers and was looking for the best way to get soft lighting with an on camera flash. Your website was the first place that showed how to achieve this without going gear crazy. Now for a technical question. One thing I have noticed while using the black foamy thing is that when using lenses that cannot go below f/4.0 aperture it does not matter how you direct the light one still gets the flat flash color when mixed in with the ambient light. The trick works well when using larger apertures since the ambient light mixes well with the bounced flash. I am going to assume that you would need to add a gel of some sort to mix the light better. Would that be your take? Thoughts? Once again thanks for this very informative website and a great book to boot. Viljay .. your choice of shutter speed and aperture will also affect how much ambient light comes into play in the final image. So I wouldn’t say that this is dependent on having large apertures. That said, bounce flash techniques usually require a medium to fast aperture due to the amount of light “eaten up” by the surface you are bouncing your flash off, and also the distance the surface is from you and your subject. So that usually does require a fast aperture for best effect. But shutter speed and ISO do matter equally. I wish you a nice day ahead! PS: great site! I am reading all your posts!! Dennis .. a camera like the D700 has the ability to change your photography. As great as the D300 is, the D700 just takes it that much further in image quality. Have a look at the 3200 ISO image here. It really is impressive performance. Your idea about the foamie thing is great. I constructed my own version from material which I found in my house. To keep it unique I named it … wait for it … black-non-foamie-thingy-majingy !!! From the few test shots on my irate kids I can already see a VAST difference in the quality of my images. Because of your site I don’t suffer from straight-flash-sindrome anymore and my shots are now so much more balanced. Hi Neil- -I was abble to find the blackfoamie thing this weekend and I was wondering if you can tell me the size that you cut it to? Joram .. hi there! As I mentioned elsewhere, the piece of foam is about 6×7 inches, but the actual dimension is usually quite smaller since I fold it and shape it and pull it back as I need. What is the difference in result of photos between an unfold foam and fold foam? Does a fold foam block lesser light and allow more light to reach the subject? In other words, by folding the foam, does it make it a little more efficient in using your speedlite than a non folding version? Jon, its just how I adjust and change it as I need at any time .. just enough to block the light from hitting my subject directly .. or hitting those people who are standing next to me, in the eyes. Hi Neil! I’ve been using a black foamie thing for over two months now and love it! Mine hangs off just about 4 or 5 inches. I am wondering if you have any simple examples of why you would adjust it longer or shorter? Since it’s not a full snoot, I can’t think of any reason I would have adjusted mine in the couple months I’ve been using it. Thanks much! Claybrook .. if the piece of foam is too long, it tends to eat up too much light. So I adjust it just short enough to flag the light as I need. Thanks for the response, as always! I get the black foam idea and the bounce concept – but why not simply use a short snoot – you then don’t have to spin it for verticals, and you have no spill at all for more efficiency. You can then have the inside of the snoot silvery like the HONL ones and not absorb any wasted flash at exit. Shooting a snoot beam can also be directed better, will have better range as it is a concentrated circle rather than a spread rectangle light shape, and over distance the smaller exit beam will spread to create a large reflected bounce back. In my understanding of your technique, it’s vital to get the flash reach your chosen bounce surface as efficiently as possible and a full snoot seems better for this. I’ve not found an explanation on your site as to why you do not use a snoot over a half snoot? George, the main reason why I don’t use a full snoot, is that the items commonly available in the shops, have a silver interior to help with the inevitable light loss. However, I quite often bounce my flash slightly towards my subject, and I would still get a measure of direct light that I don’t want. I really want to block all the light and have it all be indirect when I bounce flash. Also, the piece of black foam that I use can easily be rolled up and scrunched into your pocket. You can’t do that with any of the commercially available items that I know of. Does anyone have a link to an online store where I could buy this “Black Foamie Thing” by sheets. Thanks Medina! I’ll check out that website! Firstly, thankyou for your website – it’s amazing. Can I ask if you take group shots indoors, like table shots and the like, which may require a larger depth of field (@f8-ish) and maybe more of a direct flash technique? Andrew, you’re right. If you need more depth of field, then you have to change something so that you get more light on your subject. I sometimes hold up another unit in my left hand while taking a group shot .. and use the two flashguns (one of them on my camera), in Master / Slave mode so that I get double the power. This works well for impromptu groups. For more formal setups, it is hard to beat manual flash bounced into an umbrella, for efficiency and ease of setting up. Just bought the black foamie thing from Michael’s. .99 cents for a square foot. Pliant and easily placed on and taken off the flash. I bought a white colored one, too, in case I ever need more light. I’m a new arrival at the Tangents website, and have to say I really enjoy your content here so far. There is such a rush now to get your flash off camera and throw various umbrellas, softboxes, grids etc. on there… so this is a very refreshing reminder of the power and flexibility of on-camera flash. Brilliant technique with amazing results! I love the comment “no expensive version 2.0 coming next year”. Ha! I have been using your backwards bounce technique now for a couple of months. It truly has made a difference in my images. In sincerely thank you for the help. 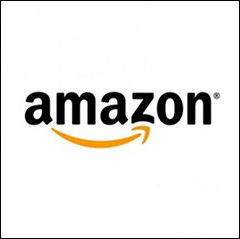 Hi, For those living in the UK, I have just bought the black foamy thing from Amazon. Just type in ‘Funky Foam Sheet A4 Black’ or A3 costing just 49p a sheet, postage is just under £3.00. I haven’t tried this technique yet, but desperately trying to improve my use of on-camera flash. Would be interested to know Neil of your view on the BetterBounceCard. as I have one of those two. Great in some situations, but because some of the fill light is directional there is still some harsh shadows, but this I believe can be avoided depending on the situation, like all techniques I guess. Thank you for all the inspiration here. Teazle … thank you for the note about the supplies in the UK. Re the BBC … my experience is similar to yours. Sometimes it is useful, but mostly I am better off bouncing flash in an indirect way, a la the Black Foamie Thing. Hmmmm…maybe that Fong guy with his spew light everywhere devices should read this and study some good common sense. Peter, I do swivel the piece of foam around as needed. But mostly, I try to keep it simple, and less of an effort. When working indoors I try to be specific about the direction, but if need be, I just rotate the camera horizontal to vertical and take the shot. The light will be soft. That’s how I have photographed maternity and babies. You really do get used to just pulling on the piece of foam and swiveling it around as much as you need to. As another example with the wedding reception, I pretty much just stay with a horizontal composition. Most of the photos at the reception will be of two or more people. That a horizontal shot. That semi-candid shot where two people will hug each other for the camera? That’s a horizontal shot. They don’t want to see that as a full-length photo .. they want to see themselves together. It’s horizontal. In the same way, you can simplify nearly every photo at the reception to a horizontal image. One exception would be the toasts. Then I keep one camera with the longer lens, and a black foamie thing swiveled around for a vertical shot. The other (wider) camera, will have it set for a horizontal shot. Hi Neil. This is probably going way back, but would manually zooming my 580EX to it’s max setting achieve a tighter patch of light, when bouncing off, say, a church wall, and have a similar effect to using a black foamie? Not really. The black foamie thing is used as a flag, not as a way to contain the spread of light. In these cases the flash is partially pointed towards my subject … and the black foamie thing is necessary then to avoid direct light from the flash. I do zoom my flash-head though, to get more efficient use from my flash. Neil, how do you get catchlights in the eyes using this method? Dave .. here you go: bounce flash and catchlights. Hey Neil. I was at a jQuery Developers conference in Boston this weekend, and I was taking a ton of photos while attending. I happen to be using just my SB-800 and the black foamie thingy, which is great for bouncing and flagging the light. A guy came up to me and asked me about it and asked if I had read your blog. I told him your blog was where I learned how to use the black foamie thing. ;-) Thanks again for all the advice. It’s meant so much. Nice job with the photos of the speakers at the podium. Ringlights are great with a lot of post production retouching. And who cares about searing the retinas of people around you. I’m on the job for my client to produce the best images that I can. Not to worry about every guest and whether their comfort level is being compromised. Come on, this “politically correct” society just goes too far so many times. Roger .. that is incredibly arrogant. It’s not ‘political correctness’ on my part to want to be less intrusive. The black foamie thing makes sense on a fundamental level in using flash. That it can shield the flash from directly blasting people in the face, is a side-benefit I will gladly take. Also consider that I may have the bride’s mother close to me while I am photographing the bride and her dad. I can either recklessly blast her in the face with flash while I am taking photographs .. or I can be much less intrusive. Keep in mind that this is the same mother of the bride who might .. or might not … recommend me to all her friends and colleagues. The truth of the matter is that most of my work is from referrals. I do my best to keep my clients happy. And to keep their families happy, and to not be *that* wedding photographer to all the guests. You know the one … the one they distinctly remember afterward for an annoying attitude and his arrogance. Anyway, I think I’ve said enough in reply. Anyone else will surely read your comment for the belligerent posturing that it is. Yesterday night, at a party, it was one moment I was embarrassed: my flash fired in the eyes of three persons. They said Wow…!, etc…, but at least they were taller then me, so not my “attitude” exploded in their eyes and brains. To be well raised, sometimes has a connection with seeking better ways to do one thing. Any thing. Hi there Nick .. There are a number of other articles explaining the technique. Follow them further on from the article on how to bounce flash. In lower light, I easily go to 800 ISO or higher. What camera are you using that you don’t want to go over 400 ISO ? 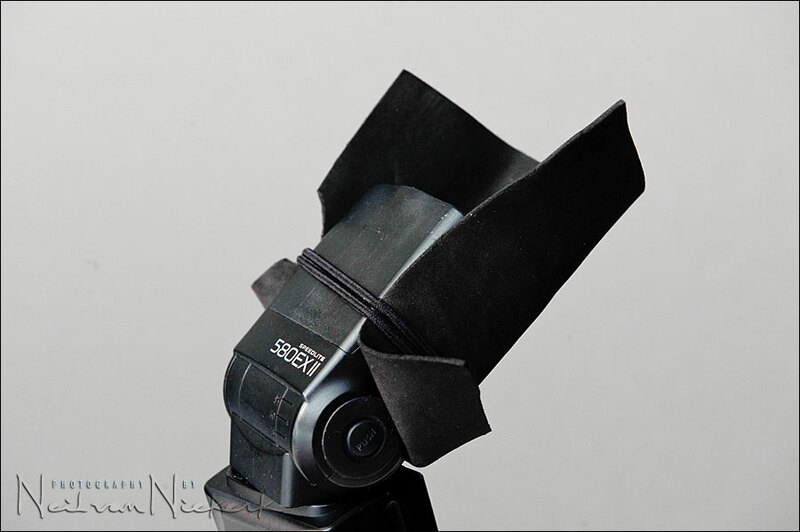 The way to use this piece of black foam, is NOT as a reflector. THat doesn’t make sense. It is there to flag your flash, and you only let so much protrude as is necessary to direct your flash … and not have any direct flash fall on your subject. I don’t use the built-in white bounce card on the speedlights. And I very very rarely use a white bounce card of any type. In any case, follow that link. All the info is in there and the related posts. What a very generous person you are to share your techniques! I am humbled by your generosity. I have a friend who is a wedding photographer who uses a flash bracket. I see that you do not from the looks of the pics in your photo blogs. With the ‘BFT’ I am assuming that you can easily do away with using a flash bracket since you are flagging the light to avoid red-eye. Or do you recommend using a flash bracket with the ‘BFT’ technique? Also, since you are flagging the light from your subject, does this not eliminate the catch-lights in the eyes? Many thanks in advance for your kind response! Marty … I don’t use a flash bracket much anymore, but a flash bracket does have its uses. A flash bracket isn’t just for minimizing red-eye, but to avoid the side-ways shadow when you shoot vertically. Re the catch-lights in the eyes, follow the links mentioned in the article with the video clip on using the black foamie thing. If you bounce your flash properly (and have bounceable surfaces, then you will get those catch-lights. Nearly predictably so. Can’t tell you how much i love this site!! If you send me your address i’ll send some goodies your way next time i’m baking! (i’ve been known to do this–not blowing smoke!) I was experimenting with this and shot a few frames of my son eating at our table w/a bunch of windows behind him in our kitchen bump out. I found the light to be much softer/natural by bouncing it above/left/on wall behind him BUT his eyes appeared pretty dull. When bounced in same spot w/out the BFT eyes were crisp and had catch lights BUT there was direct flash falling on his face. Care to weigh in on what i should do differently? Also, when you speak of dialing down flash am I correct in thinking you mean specifically also dialing down TTL-BL fill flash? Jennifer .. you do have to bounce the light so that it lights up the person’s face. Bouncing too far to the side, and their eyes will appear dark. Not good. It takes practice, but it does become much easier. Do check out the video clip where I explain how I position the flash and the black foamie thing, and how I direct the light. Yes, dialing down the flash means to dial down the Flash Exposure Compensation (FEC). 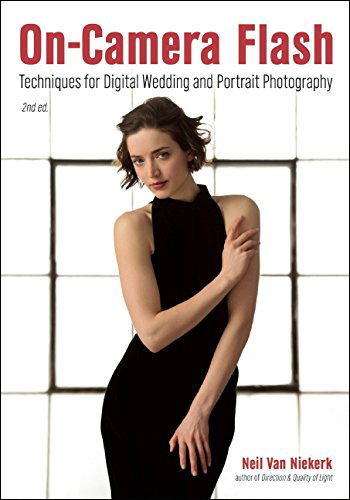 I have read and endlessly re-read your superb book on on-camera flash, and will shortly be getting an opportunity to put all the new-found knowledge (and confidence) into action. My question is regarding my brand new SB900. When you are bouncing with the BFT have you experimented using the the 3 different illumination patterns (standard, centre-weighted, even)?. Do you think it would make any significant difference, or would you suggest I just stick to using the default standard pattern? many thanks again for all your inspirational work. Since you’ll be bouncing your flash, the illumination pattern doesn’t matter. So just keep to the default. Your posts on flash are SO HELPFUL. In college I was part of an awesome photojournalism program, but the downside was, we only spent like 2 class periods talking about flash. Obviously it’s another thing you just have to go out and learn and experiment with yourself, but extra tips would have been helpful. Your posts have been a great source of help for me, so thank you much! Neil, what if you don’t have anything to bounce off of, like say I am at the playground shooting my daughter, do I use directional light? and how do I make it look not so hard? Larry, if there is nothing to bounce your flash off, then you have to adapt. Niel,thanks you for all the great resources you are sharing. 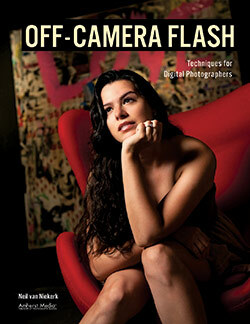 I bought your On Camera Flash Book recently and it is great. Can someone in US tell me where I can buy (not online) this black foamie thing? Any of the chains like Wall mart or Target have this ? I don’t really know what to ask for ! You can buy it as “art foam” from Michaels, the art supply store. Thanks for the reply Niel. After I posted the question ,I saw somewhere in the comments that it is available in art stores. I could pick one from AC Moore (found that it is also available im Michaels ,for anyone interested) and I put it to use and wow ,it brings a lot of difference and the best part is that it can be achieved under $1. hi- Do u miss having catchlights in the eyes since you cannot use the white bounce card? Dro, bounce your flash into the direction you want your light to come from – just like you had set up an off-camera softbox. Then the catch-lights will be there in the eyes, nearly automatically. when you shoot in decent size churches and large rooms. i shot a friends wedding yesterday at similar settings you would use, bouncing flash to my right and up off of the church walls during the processional. they were under exposed a bit as if the flash had little reach. could i have been cutting off power by having the BFT extending out too much? i read a reply by you on another post explaining this as a possible factor. the BFT was about 1.5″ – 2″ in front of my flash head. the church was fairly narrow. The BFT does cut some of the flash’s power. So if you have problems with the flash just not having enough juice, by all means do try it without the BFT. Also, if shooting wide angle, that will make the flash spread a wider field thinking it needs to shoot wide, so manually zooming flash head in at full 200mm will help a little. Remember, you are bouncing, so you already will get a wider return of flash and zooming in will concentrate the light tighter giving more power/range where it’s shooting to. I like your policy of no single flash solution. I was wondering what you use at an evening party. 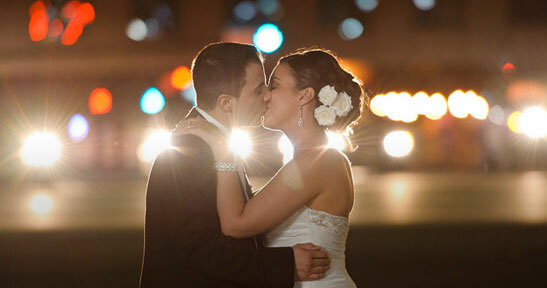 Often the lighting will be dim compared to a wedding and more “snaps” than set up shots. I’ll try all your suggestions, but would a stofen with a cut out top be best for the majority of quick shots in a party room atmosphere? If you’re in an area where you have nothing to bounce your flash off, then the Stofen with the top cut open, won’t offer you any benefits … in fact, it might just make your flash less efficient. So, I have an SB600 and it doesn’t tilt backwards, how would you use the black foamie thing in that case? Would there be anyway to make it work, or am I limited to a diffuser and bouncing it off the ceiling? Maybe use the black foamie thing tilted up and to the right or left a little? Zach .. the Nikon SB-600 does rotate 180 degrees to the one side. Then tilt it slightly “forward” so it faces back and up. Thank you for your artistry, your perseverance with us amateurs, and your attitude to your customers. I just saw your “thingy” article and it solved many problems of mine. But with one problem last week, I simply couldn’t find a solution. It was a friend’s party, out in the park, in the middle of the night with no surfaces to bounce my flash. In a moment of inspiration (or idiocy, whichever you prefer) I turn the flash 180 pointing towards my big, bald head and…it actually gave the photos a nice soft white balance. I looked kind of weird shooting a flash backwards, but it worked! I have read all your articles on BFT (and everything else!) thankyou very much. I’m still struggling a bit to understand. Please let me know if the following summary is correct…. So the BFT is used on the subject-side of the flash head when it’s being bounced forward any degree to stop direct flash falling on the subject, and it’s used on the non-subject side when the flash head is tilted backwards, simply to stop blinding those behind you – and no other reason?? So you need to swing the BFT from one side of the flash head to the other depending on whether or not the flash is pointing forward or backward?? Emily, the BFT usually sits on the underside of the flash, and then you might swivel it slightly to the side if you bounce vertically. Have a look at the video clip as posted on this main page on the black foamie thing. As 90% of my “bounces” are above and behind or on a left or right wall I find the Black Foam Thing 1) eats up too much light 2) very fidly to move it about and takes too long. The customer get impatient. I also dont shoot directly behind me I move the flash head Two notches behind from the vertical position. I’m therefore not blinding people. I therefore don’t use it, but I set my Canon 580 and 430 flash to max manual zoom (105). The only time I would need to use it is for adove and forward flash which is less then 10% of the time. I’ll have to work this one out as I havent had occasion to use it like that. Mike .. the black foamie thing, in most cases will just be a bit of a lip to block the light from directly hitting your subject when you bounce your flash forward to some extent. So if the black foamie thing eats up too much light, then you need to make sure that the BFT isn’t extended too far. It really should just be an inch or two of a lip. It does sound like you’re changing orientation a lot. If you want the same effect, but with a more professional device, then have a look at the Spinlight 360. Now about the idea that you’re not blinding people behind you when you bounce your flash, just confirm by standing behind someone who is holding your camera and flash and repeatedly firing it. First of all, your tutorials are awsome. 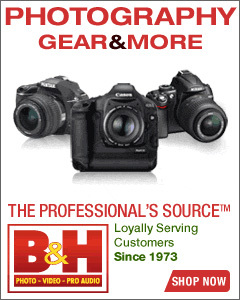 I have a Canon 430 ex ii and I want that black thing, but as I am in Brazil the Amazon one would take too long to come. Do you know if that is E.V.A.? I’m worried about using E.V.A. because above 60ºC (about 140 Fahrenheit) it can melt and glue to the flash head. I’m not even sure if that temperature is achieved when using the flash . What do you think? I don’t know what EVA is, so I can’t help you there. Maybe some other photographers from Brazil can help? Looks the same as the material listed on the BFT page. Regarding your BFT I only have a question, say you wanted to bounce your flash upwards to the ceiling, your flash unit would be completely vertical, would you still use the BFT, and in that case where? In front of your flash unit or in the back of it? Also in the same way let’s say you wanted to bounce your flash to a wall just behind you (with no one behind you also), would you still use the BFT in that case and also where? in front or at the back of your flash unit? Love your posts, Neil! The use of a BFT should be mandatory at weddings to keep from distracting guests with light bursts right in their eyes. Just wanted to say thanks… the BFT is absolute magic and produces an attractive natural light effect that’s far softer than any of my other expensive modifiers including a mid sized double diffused soft box!